Alicia never lets me down. Just when I think she's gone too far and bought me my last beer, she goes ahead and buys me another one a few months later. This time she sent me a contribution to pick up some Blue Moon. An old favorite of mine. I unfortunately didn't have the resources to drink with a slice of orange as she suggested, but I have had it before, and orange goes great with just about any Belgian Wit style beer, especially Blue Moon. I picked up a sixer of said beer to bring with me for a reunion of sorts. 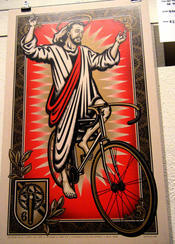 The old loft where I used to live was holding a poster show featuring artwork with bikes and bikers. There were thirty or so prints of some really amazing local artists selling for crazy low prices. As is typical with this place, it was packed shoulder to shoulder with a mix of the minneapolis bike messenger crowd and local hipsters. I managed to push and shove my way through the masses and pick up a couple of great pieces before they sold out. The real event of the evening though was seeing some of my old roommates and neighbors and friends. I hung out most of the evening on the second floor drinking beer an catching up with some people I haven't seen in ages, and of course, taking care of my bottles of Blue Moon. We were sitting in a back room behind a curtain behind a row of tables where the prints were being sold, and I have to say I felt rather V.I.P. not that it was a big deal or anything, but I was one of the elite few who got the comforts of getting my own room with a cozy chair drinking beer that was bought for me by somebody in Texas! 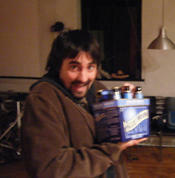 One interesting thing I learned that night, is that Blue Moon gives some really nasty beer breath. I don't know if I've ever consumed several in a row like I did last night, but when all was said and done, my girlfriend, who normally says she's rather partial to a little beer breath, couldn't stand to be anywhere neer the direction of my exhaling. She said it was more like a garlicy meal than beer breath. I tried some vigerous tooth brushing, but the problem lied for deep within, not my teeth. I did my best to breath through my nose the rest if the night. The next day, (which happens to be the very day I'm writing this), I had a couple left over beers that I hadn't made it to, so they made a great beverage for me while I brewed a batch of beer in my kitchen. A "Big Honkin' Stout" as the name of the recipe said. They do say after all (at least I do anyway), that if you're not drinking a beer while brewing beer, you could ruin the entire batch with bad beer energy. I'm not sure if it's true or not, but I'm not one to go agianst a tried and true method, so I fished up the beers. Thanks for the Beer Alicia! It was very very appreciated, and even though it gave me awful breath that my girlfriend may not forget for a long time, I still loved it!